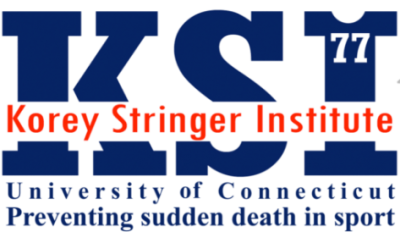 Korey Stringer Institute at the University of Connecticut is proud to announce our role in the NFL Athletic Trainer Grant Pilot Program, which is open for applications from October 19, 2016 through December 16, 2016. As part of the Play Smart. Play Safe. campaign the NFL pledged on September 14, 2016, the NFL is heading up a pilot grant program in four states – Arizona, Illinois, Oklahoma and Oregon. Up to 150 public high schools across the four pilot states will be awarded a $35,000 grant over the course of a 3-year period to assist with securing athletic trainer (AT) services. A public high school with an interscholastic football program in Arizona, Illinois, Oklahoma or Oregon. KSI will lead the administration of the NFL Athletic Trainer Pilot Grant Program as well as conduct research on the program’s impact, specifically the impact of athletic trainers on student athlete health outcomes. We hope that by bringing our expertise to this program, we can assist not only the schools who may hire ATs for the first time in their school history, but also to serve as the support system for the ATs who are accepting jobs in these schools in order to develop successful and sustainable athletic training programs across the nation. To find out more about the pilot grant program, visit: www.athletictrainergrant.com. Athletic Trainers are health care professionals who work under the direction of a licensed physician and who specialize in the prevention, recognition, emergency care, treatment, and rehabilitation of sports related injuries. A recent study reported that only 37% of high schools in the United States provide full-time athletic training services.1 Seventy of the public secondary schools acknowledge the importance of athletic training services and provide some level of medical coverage.1 With the increasing number of sports participation and sports related injuries in the high school setting, it is essential that appropriate medical coverage is available. It is important to understand what services and coverage athletic trainers’ provide. Athletic trainers do not just provide “coverage” during sporting events but provide quality health care to active individuals on and off the field. During emergencies, athletic trainers are onsite to provide immediate care to potentially life-threatening conditions and are trained to provide prompt treatment to help prevent sudden death (i.e., sudden cardiac arrest, exertional heat stroke). Furthermore, athletic trainers provide a link of communication between physicians, coaches, parents, and school nurses. Care of an athlete not only includes physical care but also psychosocial care. A safe environment is created which can result in an athlete confiding in the athletic trainer. Athlete trainers are trained to recognize potential problems (i.e., eating disorders) and can refer to the appropriate medical or professional services. Additionally, athletic trainers work towards the prevention of injuries and sudden death. Before participation, athletes are screened using medical questionaries’ and preparticipation physical examinations. 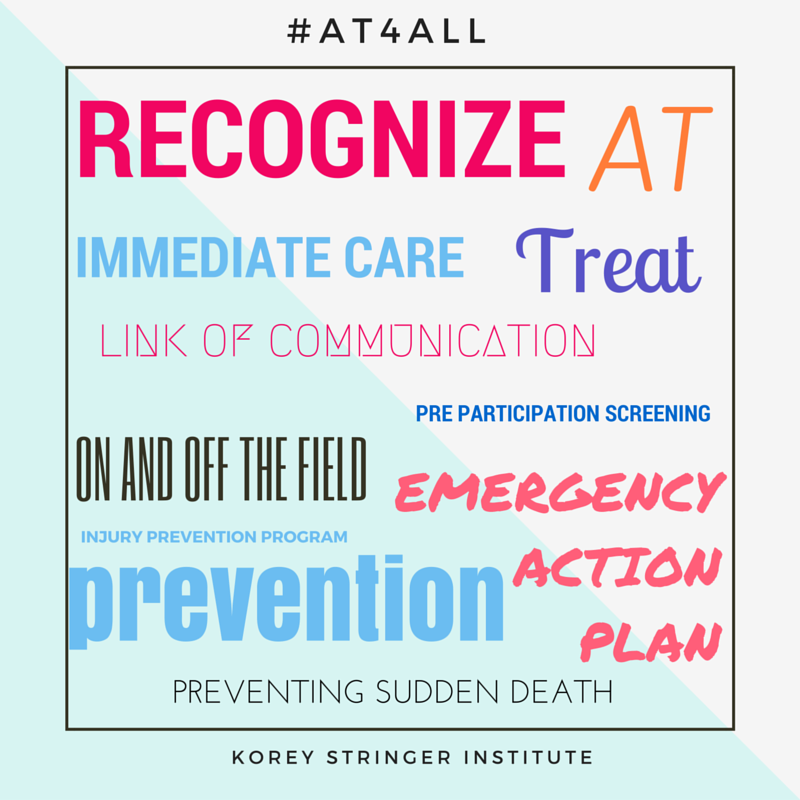 Athletic trainers are trained to identify potential risk factors and can make appropriate referrals for further screening. The preparticipation screening also allows athletic trainers to identify at risk individuals (i.e., Sickle cell trait, asthma, diabetes). Risk mitigation can be accomplished though educating parents, coaches, athletes, and administrators, as well as, through injury prevention programs. 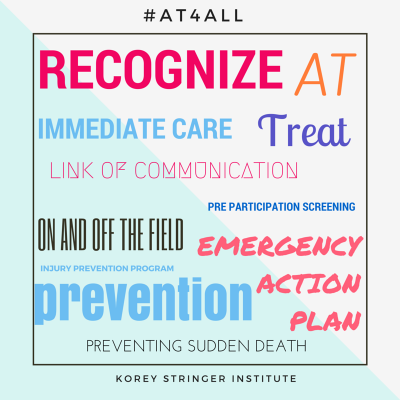 Off the field athletic trainers develop, practice and implement Emergency Action Plans (EAPS) and Policy, and Procedure manuals. A few examples of the policies that athletic trainers develop are heat acclimatization, concussion, lightning, hydration, and environmental (i.e., cold and hot weather) policies. Athletic trainers are responsible for ensuring policies are implemented and followed. Athletic trainers provide on and off field services to continually maintain health and safety in sports. Described above are just a few of the many services athletic trainers provide at the high school level. For more information, visit the National Athletic Trainers’ Association (NATA) webpage for the Secondary School Setting. Pryor RR, Casa DJ, Vandermark LW, et al. Athletic Training Services in Public Secondary Schools: A Benchmark Study. Journal of Athletic Training. 2015;50(2):156-162. doi:10.4085/1062-6050-50.2.03.